Four panels of ecru curtains with Battenburg lace that match some I already have in our "glamping" linens, total of $4 . . . YAY!!!! Lovely glass dish on a pedestal with purple handpainted irises on it . . 50 cents. It is BEAUTIFUL!! I found this really nice table runner (folded in half) for $3.00, in really nice shape, colors still nice and bright! 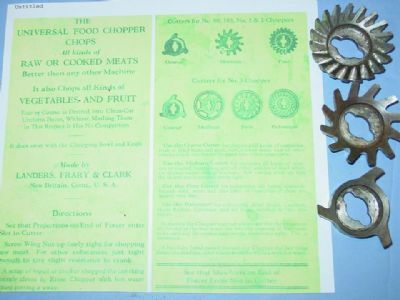 Vintage kitchen ware, circa 1920's with "french green" wooden handles. I bought this batch for $15.00, a little less than the $1.99 each. Nancy I am so jealous - I am still searching for more pastry blenders to make towel holders with. Very nice finds! We were given 4 wheels free to make our chicken tractor with. Yay! So how do you mount your towel holder? Man, oh man, Nancy! I'm jealous too! You may need to go down an article to see it. I love the look in our old farm house too. I'm always so amazed (and maybe a little jealous!) of all the great finds you gals find, but I think I got a pretty good deal today, too! At a roadside flea market, I found a Lennox 8" flower vase for $1 and a milk glass cake stand for $2. My first thougt was "oh my gosh" and my second was "I've got to tell MJ farmgirls!" "Support your local fire departments and rescue squads...volunteers making a difference"
I found some nice, big wooden handled spoons for cooking and olive oil soap today, great deals, a $1.00 each! I am so excited to have found the most amazing historical account written by one of Kit Carson's scouts, Capt. William F. Drannan. 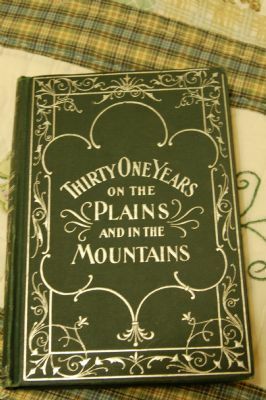 "Thirty One Years on the Plains and in the Mountains" is a detailed account of his experiences from age 15 on. It was written in 1899 and published in 1902. What a story and beautiful sketches and plates showing so many geographical and ethnigraphic details. Rivers, trails, plants, animals, scouting skills, wars, exploration, trading, scouting etc. are all mentioned. It is one of the most exciting reads I have found. I found this when I went to the Glamping Event in Coeur d'Alene, ID in an antique store in town. The book was pricey, but I could see its historical value. I am nearly finished reading it. I did shell out $20 for it, but now see it on a rare book website for $300. Crazy! It is definitely an account of the good, the bad and the ugly. It is an account of what went right and what was just plain wrong. The information in this book is so valuable historically. One really could find an old wagon train trail by his detailed descriptions of every stream, canyon, mountain mentioned. It details so many changes in history over the 31 years. I had to read in small segments just to digest the rich detail and descriptions of his experiences and meeting so many characters he introduces. Soon I am off to Salina, KS in mid-July to book hunt in their downtown. There are shelves of old treasures there. Annie, what a great find. Hope you find more books like that. I too love old books and have on from 1902 that is beautiful. What a neat old book! Just finished reading William F. Drannon's book I mentioned in the post above. How ironic, after his life as a scout, he goes into a retirement from the country and into the city, started a hotel which he loved doing, but lost it to a fire. 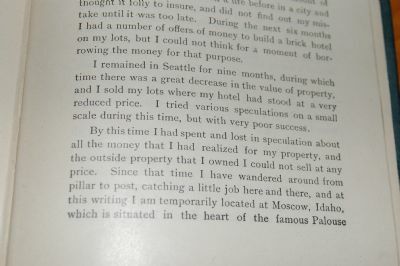 He meanders to Seattle for awhile, but just doesn't care for the city life and after his financial loss due to the fire, and property values plummeting, guess where he lands to write his story? Moscow, Idaho. 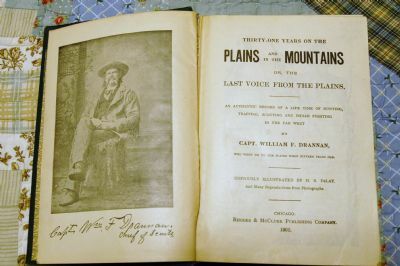 In his last few pages of the book he writes, "Since that time I have wandered around from pillar to post, cathcing a little job here and there, and at this writing I am temporarily located at Moscow, Idaho, which is situated in the heart of the famous Palouse country, one of the greatest countries on the globe for the growing of wheat, oats, barley, rye, flax and vegetables of all kinds." 1898. The book was entered into the office of the Librarian of Congress in 1900 and published in 1902. Drannon was born in 1832 at sea during his parents voyage from France to America. They settled in Tennessee. At age 4 he was orphaned by a cholera epidemic. He was raised until age 15 by a man named Drake. He was then taken under the wing of Kit Caron and became a Western Frontiersman, Indian Scout, and Author. He is buried at Elmwood Cemetery, Mineral Wells, Palo Pinto County, Texas passing away on April 23, 1913 four months after his 81st birthday. How cool that I should acquire this find in Coeur d'Alene, not that far from Moscow, ID and at a MJF event. So cool. Great read!! Hi..it's me again. I have been out and about looking for a few items to spruce up my "too modern cookie cutter house" and make it feel more "farmgirl" since I won't be in a farm or ranch house any time soon. I went to Home Goods and saw this cute little sign for the laundry room and I thought how great it would be to display the hankerchiefs my grandma Delia had given me. She even tated the border on two of them. She is no longer living and I miss her so much. Every one should have a Norwegian grandma. She grew up in Ray, North Dakota, then lived near Lake Harriet, MN before moving to California. 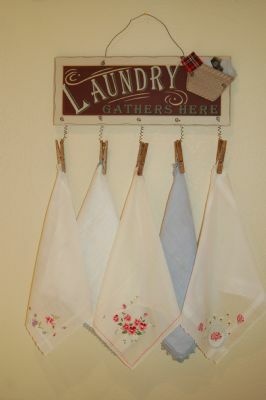 I think this is a charming way to display the hankies and adds a bit of whimsy to my laundry room. Sign was $7.00 but I wouldn't have been able to paint it and get the little clothes pins for too much less. It was worth it to me. Enjoy the photo. I also went to our brand new WinCo today. Wow...what a store. I bought all the items to make the homemade laundry detergent. How fun and useful this will be. Annette, the hankerchiefs are just precious! I love what all of your have done with your new treasures! I've hit some yard sale and junk stores and found some great items! Dave had to have this, it was just like his Mom's, it was 5 cents, what a deal. The original price was still stamped on it- 59 cents. I found an old wood plain (wood working) in the forest on a walk, what it was doing there who knows. You found some true goodies, Nancy!